In cold months, the road circling the lake becomes a snowshoe and ski route with some of the most spectacular views in any national park. CRATER LAKE, Ore. — In summer, you may feel a bit overwhelmed by the crowds that come to gaze at this natural wonder. In winter? You’ll likely have it to yourself. The Rim Drive — a 31-mile asphalt ribbon around the remnants of volcanic Mount Mazama — becomes a snowshoeing and skiing route, a winter perch from which to experience some of the most spectacular views in any national park. More than 7,700 years ago, Mazama blew its top in a cataclysmic eruption, creating America’s deepest lake in the immense crater left behind. Now, more than 700,000 people come annually to hang out in the national park that is a reminder of this event — but only 12 percent of them visit between October and April. In other words, this place is empty when the snow flies — and with an average annual snowfall of 43 feet, Crater Lake becomes a pristine ski-and-snowshoe wilderness. Only a handful of residents in Klamath Falls are regulars who explore the lake in winter, Angeli said. The national park is remote, far from any major population center, adding to its isolation in winter, he said. Winter access is from the Rim Village Visitor Center at an elevation of 7,100 feet. From there, snowshoers and cross-country skiers can head out on the closed West Rim Drive. The road dips and rolls along the west side of the lake for six miles to the North Junction intersection with the East Rim Drive, offering grand views of the lake from several vantage points along the way. During a visit on a mild day in early winter, a few snowshoers from the Ashland Hiking Group were out exploring. Two cross-country skiers pushed their way out to the Watchman Overlook, an eight-mile round-trip, with exceptional views of Wizard Island peeking up from the 2,000-foot deep lake, with not another soul in site. 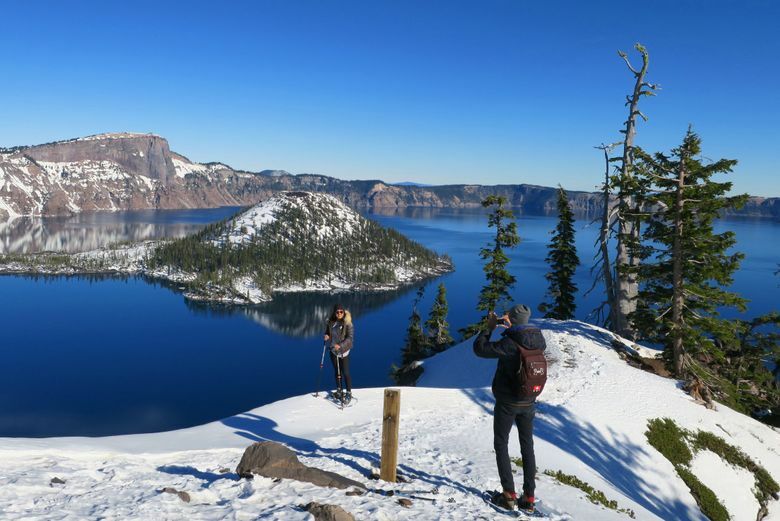 But you don’t have to ski or snowshoe to experience the lake during winter, said Marsha McCabe, chief of interpretation and cultural resources at Crater Lake. Most people just come to have a look. “The most popular activity is always viewing the lake,” McCabe said. The Rim Village lodge serves as a focal point for visitors, with a gift shop and small cafe. Beginning snowshoers might want to consider taking a free ranger-guided snowshoe walk, offered weekends and holidays at the park from late November through April. They start at 1 p.m., last two hours, and cover one to two miles of moderate-to-strenuous off-trail terrain. 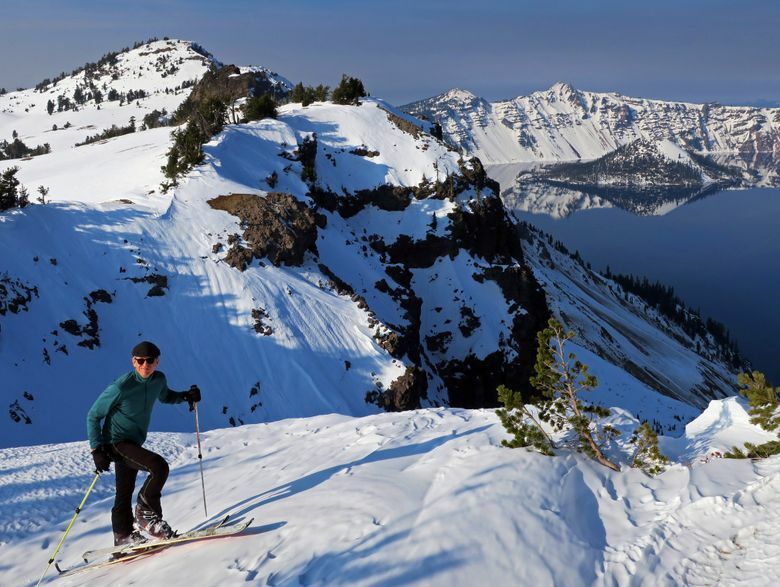 On the other end of the spectrum, experienced backcountry skiers also can find adventure on the rim at Crater Lake. One of the best day-trips into the backcountry leaves from park headquarters and travels on East Rim Drive to an overlook between Garfield and Applegate peaks, about 6.5 miles round trip. The route is spectacular, leaving the road and gently climbing about 1,000 vertical feet to the caldera rim for commanding views from the south side of the lake. Low-angle downhill turns are the reward after a lunch break overlooking the deep blue waters. 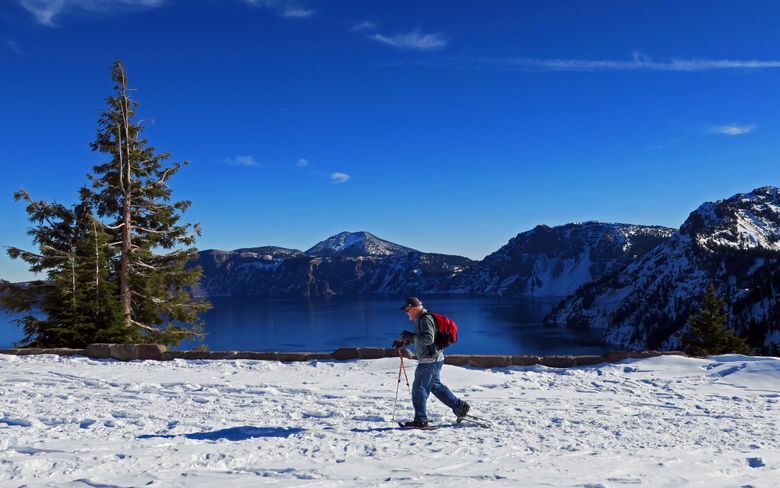 The wildest adventure at Crater Lake in winter involves circumnavigating the entire lake. Cross-country skiers can make it in about 18 hours, Angeli said, and should plan on at least one overnight camp. Snowshoers should plan on a multiday trip, he said. 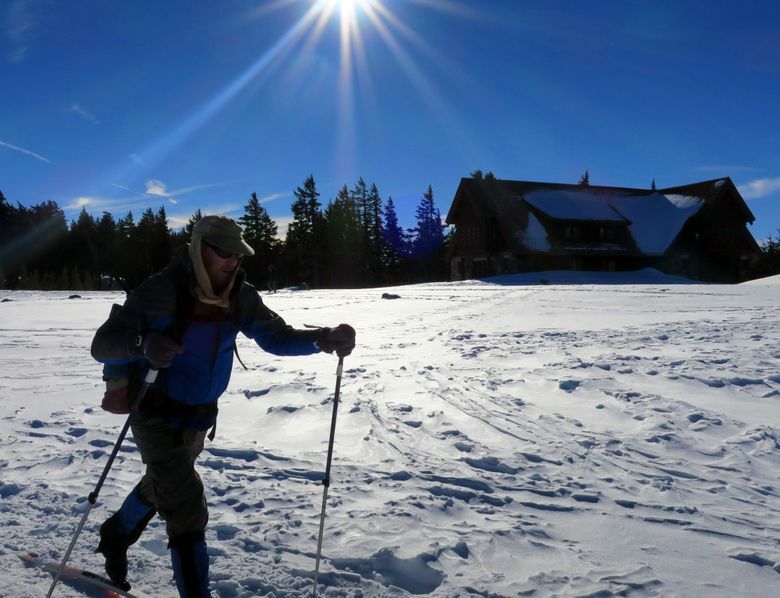 David Grimes, a park ranger at Crater Lake for 13 years, has circumnavigated the lake on snowshoes 10 times, he estimates. Grimes advises anyone trying to circumnavigate the late to be flexible on scheduling and go only if conditions are good. New-fallen snow can make the trip extremely difficult because you’re breaking trail the whole way, and icy conditions can make it feel treacherous. Crater Lake National Park is in southern Oregon, about 400 miles from Seattle. The closest city is Klamath Falls, Ore., about 44 miles away. The historic Crater Lake Lodge is closed in winter. The nearest lodging is in Fort Klamath, about 20 miles south of park headquarters, or Union Creek Resort, a lodge and collection of rustic cabins with a restaurant about 21 miles west. Other options nearby include the Prospect Hotel, 32 miles west of park headquarters. To the north, Diamond Lake offers several accommodations. From November through April, the entrance fee is reduced from the peak-season $20 to $10, good for seven days, payable at park headquarters. Snowshoes are available for rent at the Rim Village gift shop. Cost is $16 per day ($12.50 per day for children). Snowshoes for guided ranger walks are free. In Klamath Falls, rent cross-country skis or snowshoes at The Ledge outdoors store. John Nelson is a freelance writer based in Seattle. Read his blog at ourgrandtour.net.